Dry bath incubators are used in laboratories to heat samples. 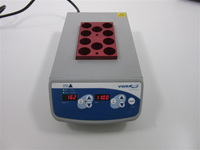 Dry bath incubators can heat samples by using either dry bath beads or a dry bath heat block. The capacity of the dry bath incubator depends on the size of the heat block that is being used. Heat blocks can hold a variety of different tube sizes from 15 milliliters up to 50 milliliters. We sell a large assortment of dry baths that can fit the need of any lab setting. The manufacturer brands that we sell include: Fisher Scientific, VWR, Labline, and Thermolyne. Please take a look at some of our dry bath incubators we currently have in stock and feel free to give us a call or send us an email if you have any questions. 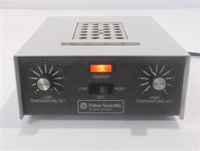 The Fisher Scientific Dry Bath Heat Block accomodates 1 block and features high wattage, constant-temperature heaters are economical, versatile, and compact. This model accepts several interchangeable blocks, accommodating various tube sizes from 0.25mL micro to 15mL. Each block has a thermometer well. Efficient heater features close tube-and-block contact with a low density design for exceptional temperature uniformity. Includes heat block.